Post season honors are beginning to come out for the fall sports teams and this week, the Tribune Recorder Leader takes a look back at what was perhaps the best season the Redskin football program has seen. Sandusky finished the season with an impressive 11-1 overall mark and went 9-0 in the regular season. Along the way they captured a GTC-East league title, a Division 7 district championship and stole the hearts of hundreds of diehard Redskin fans while advancing to the regional finals last week. Their efforts have not gone unnoticed around the league. The Redskins placed nine players on the first team All-Conference squad with two more receiving Second Team and Honorable Mention accolades. 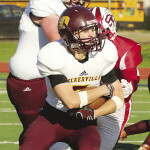 Leading the way for the Redskins was the trio of senior quarterback Brandon Potter and his go to running backs, seniors Chase Tucker and Casey Hyatt. 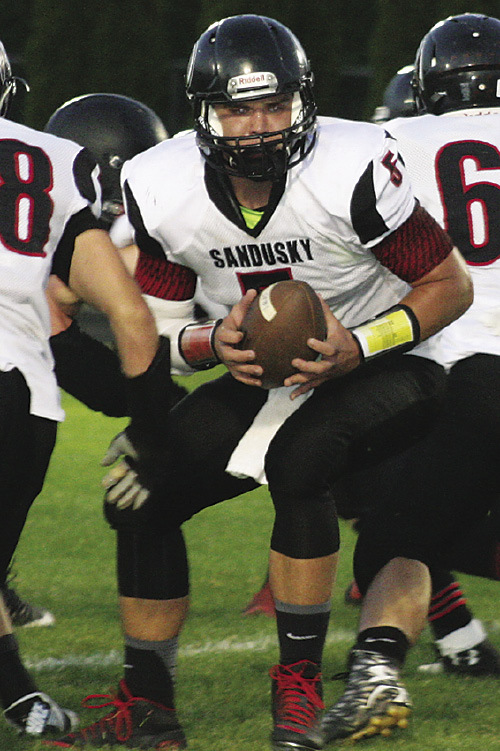 The trio of players combined for most of Sanduskys’ more than 3,000 yards of offense With both Tucker and Hyatt rushing for more than 1,000 yards each in 11 games. Also making first team offense were senior wide receiver Danny Hale, linemen Trevor Willing, Derrick Scott and Logan Hughes. Potter also was honored as the league’s top kicker while Wray DaVault received Specialist honors. All of the Redskin players selected were seniors. Matt Alexander (receiver) and Trenton Keys (offensive line) received Second Team and Honorable Mention respectively. Marlette players selected to the offensive teams included Aaron Lefler (senior receiver First Team), Chorben Chisholm sophomore lineman and senior lineman Austin Potter (honorable mention). Defensively, Sandusky placed four seniors on the First Team. Linemen Tate Larson and Trevor Willing, linebacker Derrick Scott and defensive back Joe Stone. Hale and Alexander were named to the Second Team while Potter received honorable mention for punting. Marlette’s Chisholm and Jarod Lentz were First Team choices while Isaac Dale and Brett Knox were Second Team members.